The particular brand of southern hospitality that general manager Adam Rahn brings to New Orleans' Red Fish Grill is from 'deep country' Tennessee, outside Nashville not far from the Kentucky border. He has a large family, and was involved in the kitchen from the get-go, one of the many hands it took to get food in from the garden and on to the table. Food is in his blood, he says, and his appreciation for it has only deepened in the course of his hospitality career -- which has been exclusively with the Ralph Brennan Restaurant Group. Rahn arrived in New Orleans to study at Tulane's Freeman School of Business, where he received his bachelor's degree in 2005. To help pay his way, he found work as a server at BACCO, Ralph Brennan's first restaurant, and one very dear to his heart. Though the big hurricane that hit a few months after graduation derailed Rahn's plans for law school, it crystallized his inclination to remain in an industry that he was already finding fulfilling; shortly after the storm, Rahn was asked to join the ranks of management. 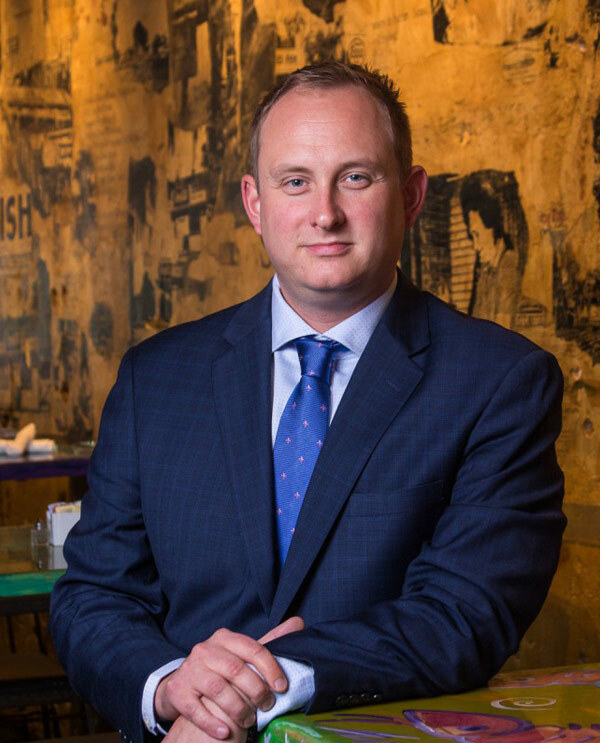 Starting out as a swing manager, Rahn had the remarkable opportunity to work in all of Ralph Brennan's New Orleans properties over the course of seven years, moving from restaurant to restaurant as needed, and getting to know the culture, staff, and philosophy of each distinctive establishment. At Ralph's on the Park, he found a mentor in legendary GM Roy Barré, who had, himself, started out as a busboy. After three years as Assistant GM under Barré, Rahn moved to Red Fish Grill, where he served as AGM for another three years before his 2016 promotion to GM. The move from the fine dining atmosphere of Ralph's on the Park to the more casual environment of Red Fish Grill was a significant departure, but Rahn explains that despite the relaxed atmosphere of the lively Bourbon Street restaurant, the same service standards are maintained. "Pressed, but without the starch," is how Ralph Brennan describes its friendly, professional level of service. Rahn's domain is a well oiled machine. He oversees a staff of nearly 150, including 50 service staff, plus ten at the bar and additional hosts and back waiters, all serving scores of enthusiastic diners. Between the Red Fish Grill regulars -- locals who come in for daily lunch or before a show -- and the steady crowd of tourists and conventioneers who bring a continual blast of fresh air, Rahn finds an ideal and invigorating balance. "I love meeting new people from all walks of life, every day," he says, "and the regulars become part of the family." Rahn is right at home in the greater New Orleans restaurant and hospitality community, "a close-knit band of professionals and folks who hold our cuisine and food culture near and dear," he says. "The food scene here reflects that 'small town feel' that I find comfortable, while being big enough and broad enough to offer some of the best cuisine in the world. Throw in a wine tasting here and there, and a festival for every day of the year, and I can't imagine how anyone could ever find themselves without something extraordinary to do in this town of ours." Where the menu is concerned, Rahn is proud that Red Fish Grill offers plenty of healthy seafood options that defy New Orleans' reputation for rich cuisine. He confesses to having a weakness for oysters, a celebrated specialty of the restaurant, which is fast approaching the 5-million-served mark. "The BBQ Oysters are like candy to me, and it's no wonder our BBQ Oyster Po'Boy brings home a trophy year after year," he laughs. But he also loves the raw Gulf oysters they serve, for which, he notes the kitchen can't take credit. "It's all Mother Nature," he says, "That's the great thing about all of our food at Red Fish Grill: we have the simple advantage of great natural product."